5S System, lean office, and Kaizen are popular terms used to describe a system used to find and remove all forms of waste in the work environment. These Kaizen principles that are used on shop floors around the world to increase productivity and efficiency can also be applied to the office environment. A 5S Office System will make your office clean, organized and office workers more efficient. Your office workers will be able to find what they need, when they need it and know exactly where everything is. A 5S Office System will lay the foundation for a lean office that you can build on. Using the 5S System will make your office more productive, cleaner, raise office workers morale and save your company money. Once this lean office foundation is in place you can build on it using the principles of Kaizen to continuously improve your office environment and office management systems. This series of articles will take you through the stages of planning and implementing a 5S Office System. The key to proper implementation of a 5S Office System is planning. Educate yourself on the 5S System and how it is used in the office. Here are some 5S System resources you will find useful. There are many sources available on the Internet as well as books. To be successful you will need to support of management and leadership. 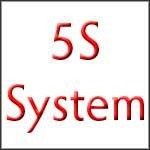 Prepare an overview of a what a 5S System is. Explain how it will make the workplace cleaner, more productive, more efficient, increase office worker morale and lower cost. Leadership likes to hear about low-cost ways to improve in these areas so these will be your key selling points. To help you plan and start a 5S Office System create a 5S Office Team. Team members will be managers, supervisors, team leads and your most organized and knowledgeable staff. Pick only a few relevant members of management. Most of the team should be office workers. The best feedback on improvement comes from those who actually do the work. They can tell you what works and what needs to be improved on. This team will help you plan and launch your 5S Office System as well as sustain it. The goal of your first 5S Office System team meeting should be to educate your team members on the 5S System and to set the goals you want to achieve. Sort – Remove everything from the office space that is not needed to do the work. Waiting – Waiting for faxes or a copy machine, for the system to come back up, for a customer response, or a handed-off file to come back. Before you launch meet with your office workers. During this meeting ask for as much feedback as you can get from them. They will have ideas you never thought of to help improve the office environment. Many of these can be integrated into the 5S Office System or used later as you build your lean office. For a 5S Office System to work you must have everyone aboard. A 5S System is dependent on each office worker following the system and doing their part. You want to highlight that the office workers are the companies most valuable resource and that a 5S Office System will make their job easier. Individual self-discipline will be required to sustain the system. By nature people are resistant to change so you should take a slow approach. It will make it easier to start and sustain the 5S System and have it accepted by office workers if they are part of the process. Here are a couple of videos about 5S in the office you may find useful. Excellent series!! I was unable to view the videos that were described. Is there anyway I could get a link to those? Here are the YouTube links.